Manuel Pellegrini has been confirmed as the new manager of Manchester City after signing a three-year contract. The 59-year-old Chilean arrives from Malaga and fills the role vacated by Roberto Mancini, who was sacked in May. 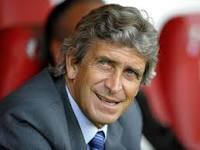 “I am delighted to accept this hugely exciting opportunity,” said Pellegrini, who will begin his new job on 24 June. Brian Kidd will remain on the coaching staff, with Ruben Cousillas joining as assistant manager, and goalkeeping coach Xabier Mancisidor and fitness coach Jose Cabello also part of the new backroom set-up. The trio worked under Pellegrini at Malaga.